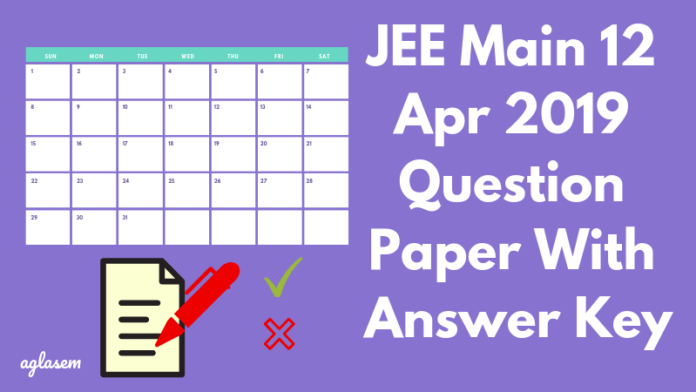 JEE Main 12 Apr 2019 Question Paper With Answer Key (Released) – Estimate Your Scores From Here! JEE Main 12 Apr 2019 Question Paper With Answer Key has been released by NTA for shift 1 and 2. The exam was conducted in two shifts, first shift from 09:30 Am -12:30 PM, and the second shift from 02:30 PM-05:30 PM. Candidates can download both Question Paper and Answer Key from the link below. To download it, application number and date of birth/ password is needed. With the help of the JEE Main Question Paper with Answer Key, the candidates can cross-check their answers and calculate their score. Keep on reading to know more details about JEE Main 12 Apr 2019 Question Paper With Answer Key. Lastest: JEE Main 12 Apr 2019 Question Paper with Answer Key released by NTA. NTA has released the Question Paper and Answer Key for JEE Main 8 April 2019 exam for both shifts. The candidates can download the Question paper and can check the Answer key here. Click Here to open the JEE Main 8 April Shift 1 Question Paper above in a new window. 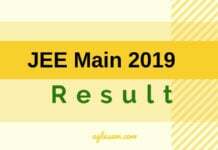 JEE Main 10 Apr 2019 Check Here – Available! Check Here – Available! The candidates can download the answer key and question paper released by the Coaching Institutes from the table below. With the help of the JEE Main 2019 Answer Key, a candidate need not have to wait for the Result declaration date. NTA is going to declare the JEE Main 2019 Result for 12 Apr 2019 on April 30, 2019, on its official website, jeemain.nic.in. It shall follow the same marking scheme, as we are going to use for the calculation of JEE Main 2019 estimated scores. 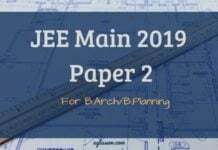 Keep a copy each of the JEE Main 2019 12 April question paper and answer key ready. Start matching your answers to the answers provided over the answer key. Mark yourself +4 marks for every correct answer. While for every incorrect answer, deduct 1 mark. Keep estimating, likewise, for all the 90 questions. After marking/ deducting your individual question scores, sum up to calculate your total JEE Main 2019 score. Candidates can check the schedule for JEE Main April 2019 Answer Key from the table below. NTA releases JEE Main 12 Apr 2019 Question paper with Answer key on jeemain.nic.in. JEE Main 12 Apr 2019 Question paper with answer key is released for all the exam dates, shifts and papers. Candidates must note that NTA releases the JEE Main 2019 answer key and question paper separately, over candidate’s login. 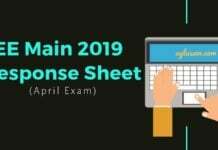 While JEE Main 2019 answer key enlists all the correct answers, the JEE Main response sheet provides the responses given by a candidate at the time of appearing for the exam. Candidates can follow the steps, provided below to download their JEE Main 2019 Question Paper with Answer key, released by NTA. How to download JEE Main 2019 Question Paper with Answer Key? Candidates are then required to log in either with their Application Number and Password or Application Number and Date of Birth. On clicking login, a candidate’s dashboard opens. Click on the “question paper” link or “answer key” link to open it. Your JEE Main 2019 Question Paper with Answer key opens on your device’s screen. Select “Save option” in PDF format to finally download it. If a candidate is not satisfied with any of the provided answer, he/she can raise objection/ challenge to provisional JEE Main 2019 answer key released by NTA. To do so, a candidate needs to login with their Application Number and Date of Birth/ Password. An additional fee of Rs. 1000 is required to be submitted in response to each of the objections raised. The payment of this fee needs to be made in online mode only, via using Debit/Credit Card/Net Banking. Before submitting the challenge, a candidate is advised to make sure that they have ticked the checkbox in front of the Option ID and hit the saved their claim, before uploading a supporting proof. NTA takes these objections into consideration and releases a fresh and final JEE Main 2019 Answer key, which cannot be challenged any further. National Testing Agency will announce the JEE Main 2019 Result for the second attempt on April 30, 2019, for Paper 1 and May 15, 2019, for Paper 2. It is going to be released online on jeemain.nic.in. The marking is done on the basis of the prescribed marking scheme. Other than the raw scores, NTA allots NTA score to all those candidates who appeared for this exam in multiple slots on different exam dates. NTA takes normalization process into account, to calculate the NTA score. Candidates who qualify JEE Main 2019 are provided admission across various NITs, IIITs and CFTIs participating though Central Seat Allocation Board (CSAB). By qualifying JEE Main 2019, a candidate also becomes eligible to appear for JEE Advanced 2019.